We installed the EVGA Precision X 4.2.0 software utility to see how the EVGA GeForce GTX 760 2GB Superclocked w/ ACX Cooling video card could be overclocked! 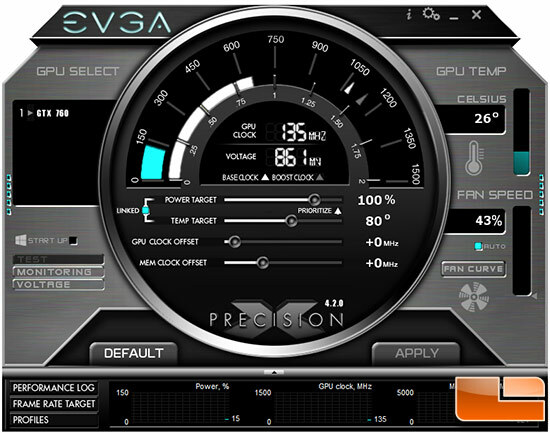 EVGA Precision X v4.2.0 includes a few new features that are new to some of the high-end NVIDIA graphics cards. Not only can you adjust the power target, GPU and Memory clock offsets within a certain range, but you can now also adjust the temperature and power targets. By default the power and temp targets are linked together, but you can unlink them and adjust them independently. 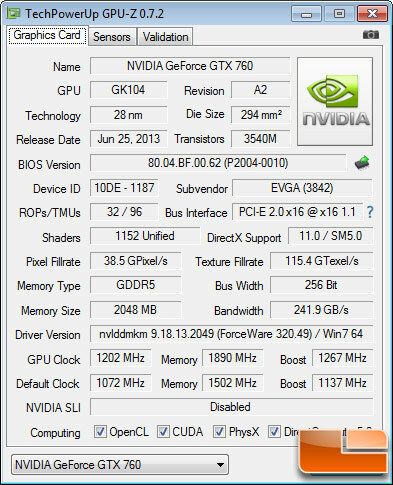 In case you forgot, the NVIDIA GeForce GTX 760 reference card has a base clock of 980MHz, a boost clock of 1072MHz and the memory runs at 6008MHz. The EVGA GeForce GTX 760 2GB Superclocked w/ ACX Cooling card comes already overclocked to 1072MHz core and 1137MHz boost, but the memory is left at 6008MHz. This card should have some room left to overclock as EVGA, so let’s take a look and see if we can tap into that extra overclocking headroom to get a free performance gain. To see how much higher we could get we increased the power target to 115% and the temperature target to 94C. This is the highest possible setting for each. We then slowly increased the GPU clock offset and memory clock offset to see how far we could go before the card would become unstable. We ended up with a GPU clock offset to +130MHz and the mem clock offset to +775MHz before we started to get encounter issues like artifacts and tearing in games. We found this overclock to be rock solid and we saw the EVGA GeForce GTX 760 SC was hitting 1320MHz thanks to boost on the core and 1890MHz memory (7560MHz effective). 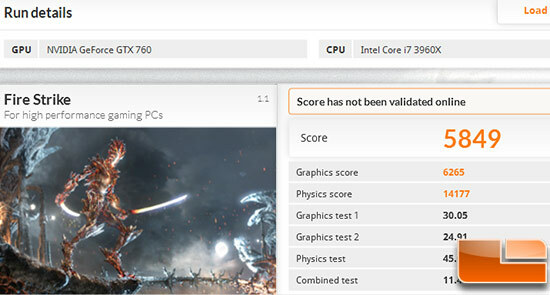 This is a very solid overclock and we were very happy with the performance gains it gave us. In 3DMark Fire Strike the base EVGA GeForce GTX 760 2GB video card with the reference clock speeds scores 5530. The EVGA GeForce GTX 760 Superclocked costs $10 more and boosts performance by ~6% as the overall score jumps up to 5849. By overclocking the EVGA GeForce GTX 760 Superclocked w/ ACX Cooling video card as far as we could we were able to get an overall score of 6613, which is a ~20% performance gain from the base model and 13% from the stock Superclocked card! The NVIDIA GeForce GTX 680 scores ~6500 points in 3DMark Fire Strike, so we have taken a $259 graphics card and overclocked it to the performance level of the previous generations $499 video card! 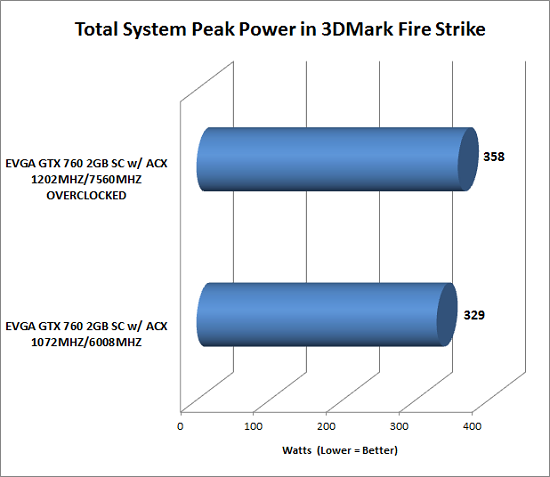 These are huge performance increases and it goes to show that overclocking is worth it! 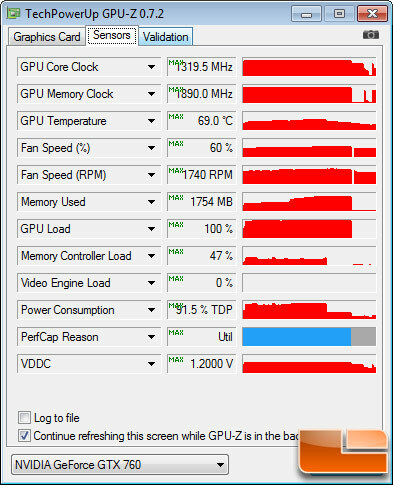 One of the downsides of overclocking is that it uses more power and things tend to get hotter and run louder. We did all of our overclocking on auto and found that the temperature during gaming sessions went from 67C to 69C. When it comes to power use we took a look at the peak power in 3DMark Fire Strike Game Test 1 (GT1) and found that it jumped up ~30 Watts on average when we looked at three runs on each setting. This is a ~9% jump in power consumption, which isn’t bad, but something to keep in mind when overclocking.